KANSAS CITY, Mo. 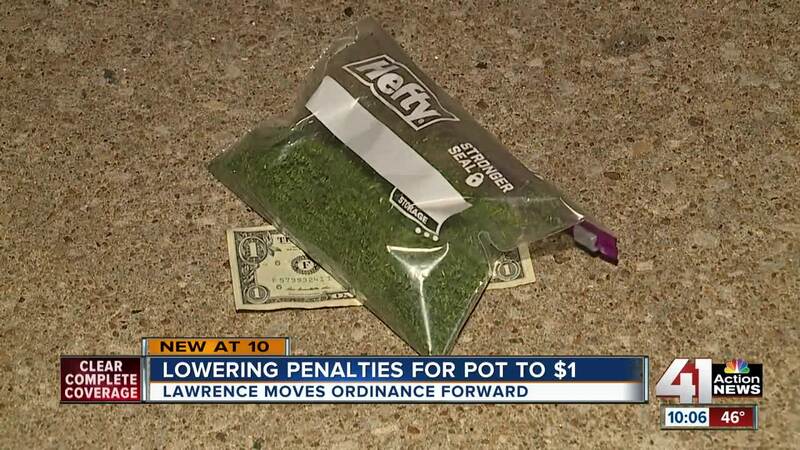 — The city of Lawrence, Kansas, on Tuesday took a step toward lowering the penalties for first- and second-time marijuana possession to $1. The city commission changed an ordinance on the penalty during a packed meeting. A second reading and vote is still necessary before the ordinance is officially changed. Currently, the minimum fine for first-time marijuana possession is $200, plus $63 in court costs. The person also has to undergo a court evaluation, which is an additional cost. If the proposed ordinance is passed, the new $1 fine would only apply to people 18 years and older who are arrested with less than 32 grams of marijuana for their first or second time. It would also eliminate mandated court evaluations and leave it to the discretion of a judge. A third arrest would still be considered a felony with significant penalties, which is why City Commissioner Stuart Boley voted no Tuesday. “I think we are lulling people into a false confidence that they can do this with impunity when they are still facing a felony charge on the third time, so I can’t support lowering the fine,” Boley said. Even if the fine is lowered, the arrest would still go on a person’s record as a misdemeanor charge. The ordinance proposal came about after a concerned citizen asked the commission to review and change the policy. “When you make the fine a dollar, basically you’re saying we’re decriminalizing marijuana. Lawrence has always been a leader in those type of liberal, progressive changes,” said David Wilkinson, who supports the change.